Being a food blogger has its perks. In my cupboards, you will find a wide variety of spices, seasonings, mixes and extracts. Sometimes I will just go open the cupboard and stare at my extracts until something pops out at me. This particular time, the Cheesecake extract stood out to me. The Christmas season is upon us. Craisins, chocolate and cheesecake are some of my favorite flavors/desserts of the holidays. I knew they would compliment each other perfectly in, you guessed it, a pudding cookie. I adapted the original Chocolate Chip Pudding Cookie recipe on my blog and the end result was fantastic. In my church, I am called to work with the youth and I love it! They love it too because I bring them yummy goodies :) I brought these cookies into class and they all loved them. My husband also raved about them. So there you have it. These cookies are kid and adult approved. These are the perfect treat for the holidays! In a medium bowl, stir together flour and baking soda and set aside. In a separate large bowl, cream butter and sugars together. Add in dry cheesecake instant pudding mix and beat until well blended. Add chocolate chips and craisins and stir in to cookie dough. Haha, you and Jocelyn crack me up! Is there no end to your pudding cookie recipes? Amazing, and delicious!!!! Nikki I bet these are so crazy good - cheesecake and pudding and white chocolate - all are my faves! Nikki...we are on the same wave length today :) I posted a very similar cookie using your pudding cookie recipe - great minds think alike! They were amazing - we loved them! The recipe calls for Cheesecake Flavoring, but the directions say Vanilla. I've never heard of Cheesecake Flavoring.- is this correct? Thanks for catching that, must have been writing that late at night haha! It is cheesecake flavoring. I found it at Kitchen Kneads, a kitchen store near where I live. If you can't find any, vanilla would work great, too. I love love love your pudding cookie recipes, Nikki! And I am in love with this version. 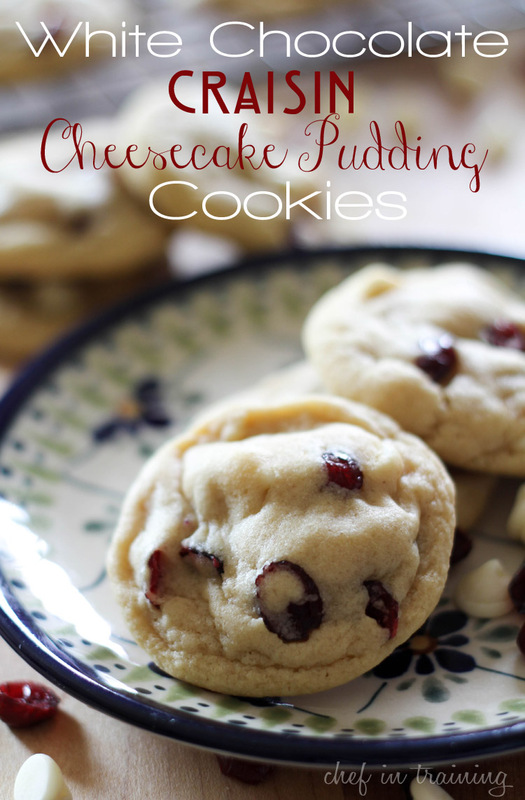 White choc chips and craisins have to be one of my fave cookie mixin combos ever! So good. And I love that you added cheesecake pudding and extract(!!) into the batter as well. Holy yum! Wow, I never knew that such a thing as cheesecake extract existed. That sounds heavenly as do these cookies. Is the Cheesecake extract like the Lorann's oil or is it something totally different all together? I have yet to try pudding in cookies but it seems like a good idea! I just adore the pudding cookies too....I always get excited to see what fun new version you are making. I have never heard of cheesecake extract, but sadly I don't have that store near me. Maybe I can find it online! This cookie version totally yells Christmas!!! Aww thanks for the shout out! I have yet to try other pudding flavors in my cookies. :P Your cookies look delicious! These cookies looks delicious, I'll give them a try. I love your pictures. I made these little lovlies last night and they were oh so delicious! how did I miss these? You are the queen of pudding cookies! never ever ever cease to amaze me with your creativity miss Nikki! You make the most beautiful cookies! When I made this recipe, the dough came out super thick, just like the pumpkin choc chip cookies. Is the batter supposed to come out like this or do I overbeat it? They were still wonderful! * I'm also using Splenda products too. Maybe that's another reason? Thanks for this and all the other yummy recipes you share with us. I thought I would share with you that I have a similar recipe, except it adds 1T of brandy, instead of the flavoring. YUM!!! Made these last night. I added 3/4 cup of chopped macadamia nuts and used vanilla(didn't have any cheesecake flavoring). Delicious! I will definitely make these again!! Would it work just as well if you substitute self rising flour for the baking soda and all purpose flour? These. are. so. goooood. And they look pretty. And the UPS man showed up at the door just time to sample them for me. Made these for my jewelry party tonight. I am 54 years old and have been making pudding cookies since I was in high school and possibly before. My mother and I used to make them together. In fact I dug out the original pudding box that we got the recipe from, the other day to show my 16 year old son. He tried to google some of the numbers from the box to see if he could figure out it's age. No luck but I am guessing its from the 1970's. I have adapted all of my cookie recipes to include pudding. I am somewhat famous (or infamous...LOL) for my cookies in Las Vegas. Everyone loves them! I was surprised when I searched Pinterest the other day for pudding cookies just how many are out there...I used to tell people my recipe was a secret!! !.